The three weeks holiday in France appears to have performed exactly the calming spell on my spirits that I needed. Since arriving in Montreal on Monday I have been more relaxed than I’ve ever been in my life. It’s unnerving how calm I’ve been. I almost feel like I could zone out whilst writing this. I could take a doze here in the library and that would be very pleasant, I think. However, it pays to remember that if I drooled on myself, that would be embarrassing. There is not time today to catch up with that I’ve thought and done in August. What a month! I’m going to try to post some photos from France and sort of catch up in stages during these next few weeks before my studies at Concordia get overwhelming. For today, I’ve picked a random picture. Doesn’t this look like parts of Alberta? 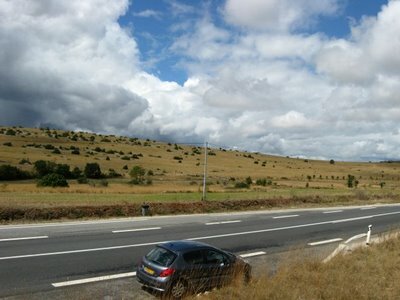 But it is in fact a plain south of Millau, France. I took it simply because of the unexpected resemblance to the south of the province I called home not so long ago!